Most Australians have a photo or two of themselves or their kids with some of our cutest Australian wildlife - koalas. 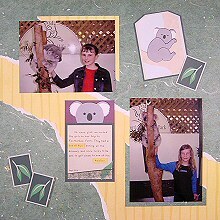 Why not dig out those photos and use the gorgeous Art of Scraps Koala Cut-Outs to embellish them. This layout was created using Beary Patch Gold Ribbon paper, Karen Foster Green Floral paper, foam tape and Art of Scraps Koala Cut-Outs. This layout is quite quick and simple to reproduce. It also gives you a great opportunity to practice those tearing skills. Begin with your green paper. Tear a section for the bottom left-hand corner. Make sure you tear towards you so you get that nice white edge. Also tear a larger section for the top right-hand corner. Again, tear towards you so you have a white edge. Adhere the smaller piece (for the bottom left-hand corner) to the bottom left-hand corner of your gold stripe paper. Make sure the stripes are vertical. Tear a triangle from the top right-hand corner and put it aside. This triangle will be used as a partial matt for one of your photos. Now you have a hole in the top of your page, but not to worry. Cover it up by adhering your larger piece of green paper on top. Your background is now complete. Partially matt your first photo to your gold triangle so that you now have a border around most of the top and right-hand sides of your photo. When you are happy with it, adhere to your background so that the photo covers both the green paper and part of the yellow strip across your page. Make sure the triangle does not overlap this strip as it will upset the balance of your page. Use your scrap of green paper and the same idea to create a partial matt for your second photo. This time, the photo is taller so try using a different shape. By creating a border all the way across the bottom and up both sides of your photo, you are easily able to mirror the contour of your yellow strip and add some balance. It's now time to use those Art of Scraps Koala Cut-Outs. Begin by cutting out the images you wish to use. The journal box is sufficiently decorated that all you have to do is write your journalling neatly onto it. If you wish, you can do what I did and dress it up a little. I began by writing my journaling directly into the box. I then chose a couple of words and wrote them on scrap of gold paper. I cut them out and stuck them on top of their corresponding words to add a little interest to my writing. When you are happy with your journaling, position all your cut-outs on your page and adhere them. To add a little dimension, use foam tape to adhere one of the leaf tiles in the bottom left-hand corner. This layout is a great way to capture those special moments with our native animals and can be attempted by scrappers of all levels.